Be the first to share your favorite memory, photo or story of Dr. Susann. This memorial page is dedicated for family, friends and future generations to celebrate the life of their loved one. Our hearts are filled with sadness at the loss of Susann Schetter, a truly beautiful, talented and caring wife, mother, daughter, sister, aunt, and physician. Susann Schetter DO, passed away December 24th, 2018 at Hospice and Community Care in Lancaster PA. Susann had battled a stage IV Pancreatic cancer diagnosis for 16 months. Tenacious, composed and always graceful in the face of a devastating stage IV diagnosis she, and we with her lived life to the fullest. In the time since her diagnosis Susann was able to attended the wedding of a niece in Chicago, visit Florida with family, travel to Puerto Vallarta Mexico to see dear friends perform in a play, attend the graduation of our son Benjamin from Oberlin College in the spring of 2018. The three of us also sandwiched two post graduation family trips (between chemo treatments), first to Banff National park in Canada and then to Portugal. Even as late as the mid term election Susann refused an absentee ballot and via wheelchair voted at our local polling place in Highville. That was Susann, never relenting to the disease and packing the greatest amount of her love for life into the time she had left. Along the way she stuck her toes in the sand, discovered a wild orchid by a Canadian glacial lake, exploring a beautiful peacock filled garden in Porto and visiting a tenth century castle. A consummate physician, Susann was a D.O. and practiced Radiology, specializing in breast health at Penn State Hershey Medical Center since 2004. She served as associate professor of radiology, associate chief medical officer for Penn State Health Medical Group and medical director of the Penn State Health Breast Center. The Penn State Health Breast Center that Susann directed is ranked as one of the best in the US. Knowledgable, caring and compassionate Susann’s empathy and humanity defined her approach to advancing the care that her patients received, she always considered the patient first in the evolution of developing the environment and services that define the world class Penn State Health Breast Center. Susann’s smile lit up a room. She was as graceful on the ski slopes and dance floor as she was on horseback. Everyone benefited from Susann’s exceptional culinary skills, our table hosted many joyous, loving dinners with friends and family. Susann had a deep understanding of her families cooking traditions and added her own fantastic twist to the dishes that she prepared and we were lucky enough to enjoy. Susann also had her artistic side which was expressed in many forms, including garden design, textile arts, music and of course her equestrian activities. 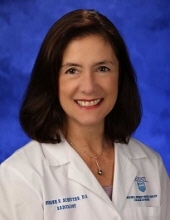 Susann was very active with the AOCR (American Osteopathic College of Radiology) serving as a board member since 2014 elected as Secretary 2015 - 2017, became an AOCR Fellow in 2016 and was then elected Vice President 2017 - 2018. The AOCR awarded Susann the title of Honorary President on May 20th, 2018. “As a member of the American Osteopathic College of Radiology (AOCR) Board of Directors and the AOCR Education Foundation, Dr. Schetter was a strong advocate on behalf of the Young Physicians. With her encouragement, the AOCR Education Foundation has increased the opportunities to engage and support our younger members. Contributions received would allow the Foundation to further its endeavors and support for the Young Physicians. or to the Dr. Susann Schetter Memorial Scholarship for medical students https://engage.pennstatehealth.org/schetter. Please make donations to these funds in lieu of flowers. Susann was 63. Beloved wife of Michael Jennings of Millersville, PA. Loving and devoted mother of Ben Jennings of Millersville, PA. Beloved daughter of George Albert Schetter, Sr. and the late Anne (nee Leonardi). Loving granddaughter of Mary Rose Leonardi. Dear sister of Karen A. McGonigle (Kyle) of Cherry Hill, NJ and George A. Schetter (Wendy) of Gilbert, AZ. Dearest niece of Rosemary Hirsekorn of Brant Beach, NJ and Joseph Leonardi of Barefoot Bay, FL. Due notice of Susann’s funeral services will be posted here at a later date. Please visit schetterfh.com to share your condolences with the family. To send flowers or a remembrance gift to the family of Dr. Susann Schetter, please visit our Tribute Store. "Email Address" would like to share the life celebration of Dr. Susann Schetter. Click on the "link" to go to share a favorite memory or leave a condolence message for the family.